Hope's Cafe: Mixbook Photo Book Review and Giveaway!! I absolutely love photo books. I love the ease of creating and customizing a photo book online, rather than scrap-booking. There are so many options, styles, sizes and designs available that you will never end up with 2 photo books that are the same. I recently had the opportunity to create a photo book on Mixbook.com for review, and they have a great variety of options for all your photo book needs! I designed an 11x8.5 landscape book with a hardcover. There were many themes to choose from, such as travel, birthday, wedding, etc. or you could start with a blank book, and customize it. This is the option I chose, and added a simple blue background to each page in the book. Uploading and adding the pictures was very easy, and I was able to arrange each page according to my preference. Size and number of images per page, layout, etc were quite simple to arrange. Then I was able to add text, and style it-size, font, color, etc. There are also scrapbook images/text you can add, which I took advantage of as well. Fun little clipart images and words, such as "family", "memories", etc. Once I finished my book and placed the order, it only took a few days for me to get a shipping notice, and within a week or so of ordering, I had my photo book in hand! I was very impressed with how it turned out! 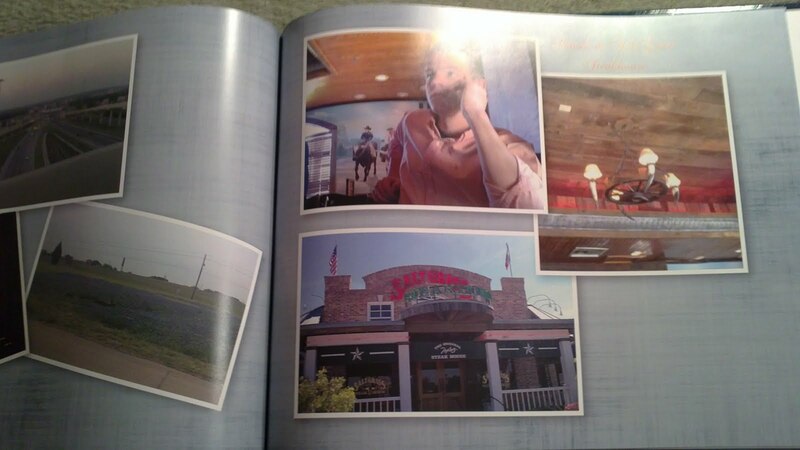 I made this book a sort of memory book from our trip to Texas and New Mexico, and included pics of everything-from dining to driving, sleeping to swimming, and just plain ole family fun! The whole family has enjoyed paging through it, and it will definitely be a wonderful memory of our fun trip! Mixbook made it easy to create a photo book masterpiece that we will be enjoying for a long time to come! Mixbook is offering 20% off any order to my readers! May be used once per customer. Simply enter HOPEMX20 at checkout! "Mixbook was started with the idea that friends should be able to create books together. Though Mixbook software makes book creation easy and fun, it also allows groups of people to build books together. Now friends finally have a way to share their memories online! As the creator of the book, you can control every aspect of the book and edit or delete any page, but your friends can still give the book their own personalized stamp. Using our collaboration technology, events can now be captured from different points of view in a single book. Our photo book creator was designed to be easy to use and all online - no software download is necessary. We offer hundreds of layouts and backgrounds to choose from along with customizable frames and text to make your book beautiful. Just pick a layout, drag-and-drop your photos into the photo slots, and edit to your heart's content. Photo Integration - take photos from sites like Flickr, Facebook, and Yahoo! Photo search to use in your Mixbook"
Mixbook is giving a gift code good for one 11x8.5 Hardcover Landscape Photo Book to one of my readers!! Go to Mixbook and tell me what size photo book would best fit your needs! 1 entry-Tell me what event/occasion you would create the photo book for! This giveaway ends Monday, May 16, 2011, at 11:59 p.m. Please leave a valid email address in each comment, as this is how the winner will be notified. Winner will have 48 hours to respond, or another winner will be chosen. Giveaway open to US residents (lower 48 states) only. Disclaimer: I was not monetarily compensated in any way for this post. All thoughts and opinions are mine. All quotes taken from the Mixbook.com website. I would create a book for this past school year. I like the 8x6 pocket landscape. I would use this photo book for Jacob's baby pictures...I don't have his album done (started) yet! I like the 12x12 Deluxe Square size! I would do it for a family members birthday. I like the 12 X 12 square but that's just because I have OCD and it's even in dimension. Lol. I would love to get this to document my daughter's last two years in high school She will be a junior next year. Thanks for the chance. I like the 14x11" Coffee Table Landscape. I will use it for my wedding book. I would make the photobook about the first two years of my marriage - something I've been meaning to do for 4 years now! Left a comment on your desk review post.